Definition at line 118 of file llvoavatar.h. Definition at line 137 of file llvoavatar.h. Definition at line 123 of file llvoavatar.h. Definition at line 124 of file llvoavatar.h. Definition at line 8751 of file llvoavatar.cpp. 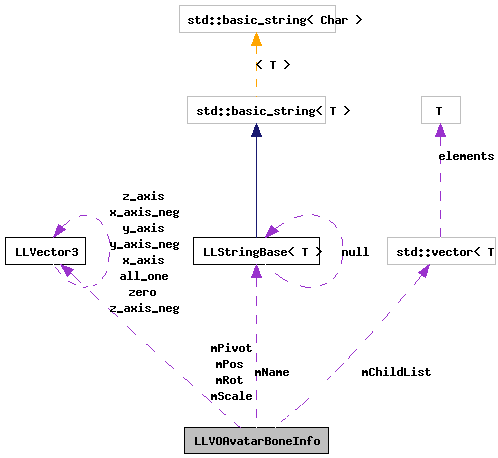 References LLXmlTree::addAttributeString(), FALSE, LLXmlTreeNode::getFastAttributeString(), LLXmlTreeNode::getFastAttributeVector3(), LLXmlTreeNode::getFirstChild(), LLXmlTreeNode::getName(), LLXmlTreeNode::getNextChild(), LLXmlTreeNode::hasName(), llendl, llwarns, mChildList, mIsJoint, mName, mPivot, mPos, mRot, mScale, and TRUE. Definition at line 120 of file llvoavatar.h. Definition at line 121 of file llvoavatar.h. Definition at line 138 of file llvoavatar.h. Referenced by parseXml(), LLVOAvatar::setupBone(), and ~LLVOAvatarBoneInfo(). Definition at line 132 of file llvoavatar.h. Referenced by parseXml(), and LLVOAvatar::setupBone(). Definition at line 131 of file llvoavatar.h. Definition at line 136 of file llvoavatar.h. Definition at line 133 of file llvoavatar.h. Definition at line 134 of file llvoavatar.h. Definition at line 135 of file llvoavatar.h.